We surveyed top CMOs to get the real story about how they use social media. 90% of CMOs participate in three or more social media marketing activities. Here's your chance to see what's most important — and most impactful. It's true: results go far beyond increased site traffic — or even improvements in marketing. 89% of CMOs use some form of user-generated content to make product and service decisions. See how CMOs use — and measure — social media, from 2009 to 2011. 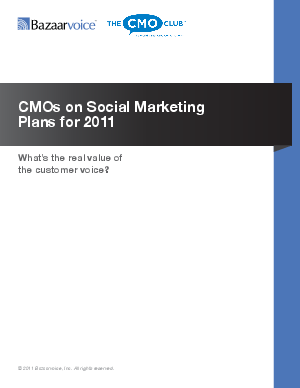 Download your free copy of "CMOs on Social Marketing Plans for 2011: What's the Real Value of the Customer Voice?" now.